A report from The New York Times indicates customers with solar panel maker Global Efficient Energy (GEE) claim they were scammed out of nearly $20,000 on promises of major energy savings. The Texas-based solar panel installer has earned a lot of ill will, according to The NYT, as more than a smattering of GEE customers contacted the Better Business Bureau with complaints about the company. In fact, “after the company installed solar panels on our roof, solar-powered fans in our attic and a bunch of energy-saving foam and sealants, our electricity bill barely changed,” Gregg said. Gregg called and emailed the company to vent and ask for a refund on the panels but received no response. The NYT also pointed out a series of complaints from other customers at the Better Business Bureau website. The NYT then reached out to GEE’s chief financial officer, David Noyes, who claimed that Gregg was doing great with his solar panels. Noyes later claimed in a voice message to The NYT that the issue with Gregg’s system was resolved. Yet the company later said it ended up leaving the solar panels on Gregg’s home. GEE also forced him to sign a confidentiality agreement, thus making it nearly impossible to determine how the issue was ultimately resolved. The report comes as the solar panel industry financial problems continue to grow. The hedge fund Gilder Gagnon Howe & Co., for instance, owned 24 percent, or 832,139 shares, of solar panel giant SolarCity at the end of the first quarter of 2016, but that was before they sold off all but 43,840 shares of SolarCity stock at the end of June. Other solar companies are going bankrupt. Solar company SunEdison is on the verge of complete collapse, as the company was forced to stiff shareholders as its debts outweigh assets by at least $1 billion. The company is “hopelessly insolvent,” Judge Stuart Bernstein said in an August 11 decision announcing SunEdison’s shareholders won’t get an official voice in the bankruptcy. Empitor caveat, always research the output throughout the whole year and not accept the maximum daylight hours as your average. In the SW of the U.K. We see Febuary 12% of a panels output of July. Without incentives of free power from your own panels and you get paid as well it will not work. The distribution and load balancing of demand and load becomes difficult at 10% green power and with 20% impossible without power cuts. Your free lunch costs dear! See? SEE? This is why we should git gummint out of them markets, cuz businesses ain’t corrupt and can do business better’n gummint! Why don’t you put your money where your mouth is. Call that solar company and buy a $20K installation. You can make whatever claims you want, but no one is going to go to the trouble of actually checking them out. The hedge fund dumping 80% of their Solar City shares says it all. Solar power only makes sense in isolated places where the power requirements are very low and it is too expensive to run distribution lines. Where installed AC distribution exists, it is Always cheaper than solar per unit of power. Solar cells start to slowly degrade from the moment they are activated. Every 10 to 20 years they need to be replaced. Golly gosh, I guess your rant observation means solar is going to stop doubling every ~23 months or so. You just crashed an industry today. I hope you’re happy with yourself, mister. Wind and solar both have huge “associated” costs, which is why Europe is cutting back on them as primary generation sources. There are articles right above this Comment section that discuss those problems! Europe isn’t “cutting back”. It is slowing down rapid development, thanks! BTW, fossil also has huge associated costs to public health and ecosystem integrity. They aren’t on the chart either. When you put up a chart showing “huge” associated costs to the public health stream etc. and they overwhelm all those associated with wind and solar, you might have a point. But you didn’t, so you don’t. Is this blather asking for a chart? Is this what this is? I could be wrong but I don’t think a confidentiality agreement would stand if the company didn’t keep their end of the deal. The Energy Returned On Energy Invested (EROEI) for a solar PV project in Austin TX according to Table 8.1 of Howard Odum’s book Environmental Accounting is 0.48. Solar PV is, by definition, unsustainable. Wind Power is worse. By my calculations the EROEI is 0.29. Solar and wind power is a scam. That’s odd – you didn’t mention the EROEI of fossil. Why not? coal = 2.5, wood = 3.6, nuclear = 4.5, solar water heater = 0.18, farm windmill = 0.03. Every number you have given so far is way low. The majority of Studies have all your numbers much higher. Very true. The more revealing conclusion is the order in which these energies would be listed from best to worst. Yes, the EROEIs you gave are way low. majority of studies have solar and wind in the 4-5s. So your assertion upthread is false. As with climate, you have to get away from ‘models predict’ and move towards the accountability of ‘measured outcome’. No, you can’t change the data here either. That’s odd. My figures are nothing like yours. Someone is lying to you if those referenced figures are accurate as presented by you. Reminds me of my own biz – health care. Everyone prescribed statins when, in fact, 100 people have to take a statin for 1 of them to get a result different from the control group. My apologies to those of you on Lipitor. You’re not alone Brin. The published NNH (that’s Number Needed to Harm) is 10. That is, 1 in 10 subjects developed serious damage whereas the NNT (……. to treat) was 100. You tell me why we recommend them because I don’t know. Solar and wind power are an enormous waste of valuable resources – they are only applicable in certain circumstances in limited usage…… They will never replace our current generation technology. Of course foolish uneducated politicians may well cause our grids to become increasingly unstable due to their fundamental ignorance of science. Ah, that explains all those news stories describing countries that got 80, 90, 100% of electricity from renewables. Got it. Scotland. Costa Rica. Iceland. Portugal. More? Who will soon have 100% renewables? Major economies. Time for the US to remove itself from being the largest dumper of Greenhouse gases. The World is not your dump. Everything you list is powered by that. You actually believe a clearly VERY biased source “eco watch”. Australia has the Snowy Mountain hydroelectric system (one of the largest in the world) and Victoria continuously mines and burns massive amounts of brown coal at Yallourn. Most of Australia is EMPTY DESERT. Iceland also has a enormous hydroelectric power system plus geothermal. No one decrys the existing hydro and geo schemes that have been around for decades. Greenies are not being honest because most people look to solar and wind as the real newcomers that will supposedly make a difference. Besides your basic assumption about GHGs is totally false. AGW is complete and utter pseudo-scientific garbage. Name those countries Dano. And what a flawless body of knowledge you have, based on “all those news stories”. Are you a child ? I know VERY few adults that don’t challenge most of what they read. The most poorly trained propagandists in our world are the journalists in the USA. We know they are nearly 100% lefties. Your media is a farce of leftie ideology. Hilarious….. Portugal ran for 107 hours. Why didn’t they continue indefinitely. I have been to Costa Rica, very small country with very small electricity use. What happened to all the real countries with significant industrial bases. Portugal and Costa Rica are basically third world rural economies. Dano, you are a dreamer. And desperate to believe in your world powered by renewables. There is not enough area in the world to replace the terawatts needed by just one large industrial country. I have also witnessed several very large arrays in California…… Problems keeping them clean and cool enough (the cooling takes power). Solar and Wind are wasteful pipe dreams of fools with no background in REAL power generation. You had no idea. Now you do. A dreamer Dano. Two agrarian nations do not constitute any reality for “renewables” (solar / wind) being any form of viable in today’s industrial world. I do not count hydro and geothermal as “new” ….. They have made up everyone’s’ base power for decades. The “great white hope” of today’s renewables (solar and wind power) are a tragic waste of precious resources (e.g. rare earths) that should be used in other industries. 0.6% of USA for solar. The world? An area the size of California. You are cherry picking data by not considering wind and hydro. It can be done. Has been already. “the overall area of the US interstate highway system, which was constructed in just 35 years, is 94,000 square kilometres, or 20% of the overall required solar panel coverage area for the world. Given the USA also consumes about 20% of the world’s energy, what it has in highway infrastructure already in terms of land area is enough to power the nation if an equivalent amount was used for solar panels”. You are another dreamer Wayne….. People unfamiliar with power generation simply do not understand how, when and where it is generated. You make the traditional simplistic assumptions that, if I need this much power, how many solar cells are needed and over what area. In two words – total RUBBISH. Clearly you do not understand the properties (including large negatives) of solar cells. And you clearly do not understand their relationship to the sun including how hot they can get. Of course everyone avoids the 10000 pound gorilla in the room, how incredibly costly and wasteful of land mass and precious resources they are. No solar cell in the world ( I personally know the inventor of the most efficient solar cell in the world) is guaranteed to last more than 25 years……. Factoring in the limited life, they are way too expensive. Plus your comparison with an inert highway infrastructure is very foolish. It is not even worth commenting on. I am cherry picking hydro and geo because they have been a small part of the generating plant for many decades. replace fossil fuels and nuclear EVER. I bought my solar panels for $19,000 from a guy who looked like fat alive Gary Coleman. I got a 50% discount from $20,000. Such as Seals. It is much “better” when the taxpayer and regular electric utility customer pick up the tab. In NJ, politicians got it done through forcing the utilities to pay SRECs to solar panel installing residences. Coupled with the federal tax credit, the solar panel installing residence only ends up paying somewhere in the neighborhood of 20% of the real up-front costs. The remaining 80% is other people’s money. Politicians live to fleece us. I wonder if the CEO’s are familiar with the term kneecapping? Just wondering. Long before the situation got so bad, I would have sent copies of pictures of the wives and kids of the company management. No threat, just pictures, lots of pictures and let them make a few assumptions. Solar & wind power desperately need ultra massive batteries to even the flow on demand. Batteries the size of football stadiums until technology improves. And….don’t forget about the massive solar project SW of Vegas in the CA desert. Someone fudged the figures on how much sun there was by a factor of 2 (just a slight miscalculation in a liberals view) and the 2+Billion dollar project is not working as intended.Wait until that one goes bust….will make Solindra look like a dress rehersal. 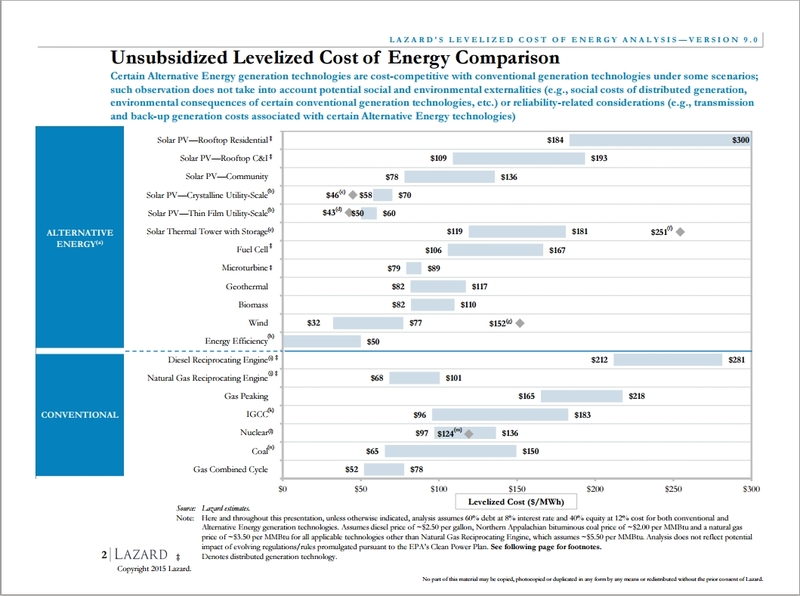 You should already know the drill by now: If any alternative energy has to be subsidized, its Energy Returned On Energy Invested more than likely is greater than “1”, and is thus unsustainable.